1) What is division of labour? It is concerned with dividing the total work into a number of processes each of which will be performed by different individuals. 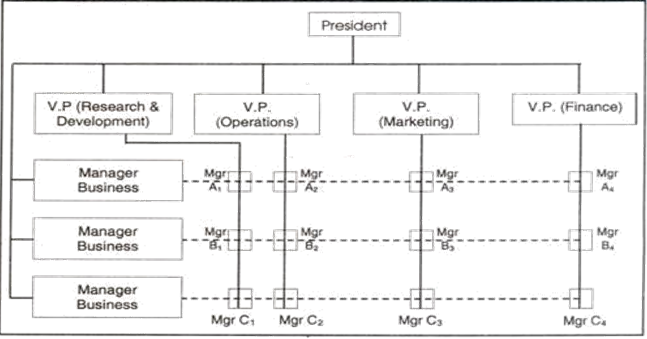 2) What is meant by organization structure? 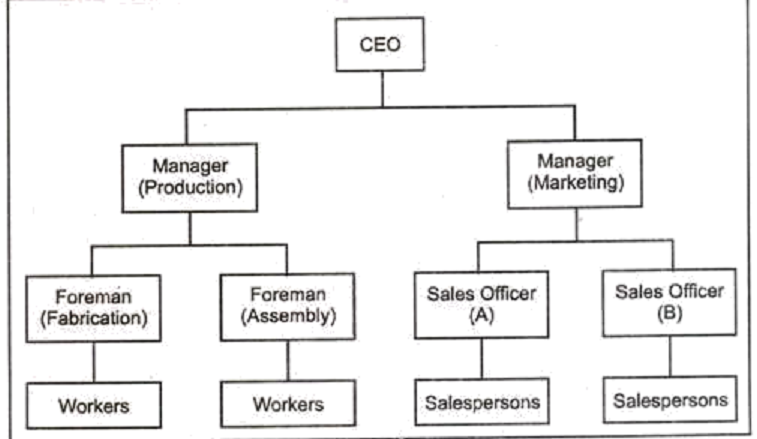 An organization structure explains the positions and official relationships between the various individuals working in an organization. 3) What is formal organization? Formal organization is created for the accomplishment of the enterprise objectives. It provides official relationship between the individuals. It has well established rules and procedures. 4) Why is line organization called military organization? Here, the superior at the top makes decision and communicates his decisions and assigns certain work to his immediate subordinate. There is a vertical flow of authority. 5) What is an adhoc committee? It is a temporary committee that is created for a specific purpose. As soon as the purpose has been accomplished, the committee stands dissolved. Authority is an official right of a person to do and make things happen in an organization. Power is the capacity of a person to act and influence others. A person gets power by his intelligence, knowledge, skill and personal traits. The process of delegation involves the determination of results expected, assignment of task, delegation of authority for the accomplishment of these tasks. Responsibility is the duty of the subordinate to whom some work has been assigned by a superior to perform the task required. 10) What do you mean by decentralization? Decentralization of authority is the extent to which power and authority are delegated to lower levels in an organized structure. It can flow in any direction. nature; hence, it is legitimate. 2) Distinguish between authority and responsibility. It can be delegated to others. to complete an assigned work. 3. Explain the features of formal and informal organization? (1) The formal organizational structure is created intentionally by the process of organizing. (2) The purpose of formal organisation structure is achievement of organizational goal. (3) In formal organizational structure each individual is assigned a specific job. (4) In formal organisation every individual is assigned a fixed authority or decision-making power. (5) Formal organizational structure results in creation of superior-subordinate relations. (6) Formal organizational structure creates a scalar chain of communication in the organisation. (1) Informal organizational structure gets created automatically without any intended efforts of managers. (2) Informal organizational structure is formed by the employees to get psychological satisfaction. (3) Informal organizational structure does not follow any fixed path of flow of authority or communication. (4) Source of information cannot be known under informal structure as any person can communicate with anyone in the organisation. (5) The existence of informal organizational structure depends on the formal organisation structure. A line organisation has only direct, vertical relationships between different levels in the firm. There is only line departments-departments directly involved in accomplishing the primary goal of the organisation. For example, in a typical firm, line departments include production and marketing. In a line organisation authority follows the chain of command. 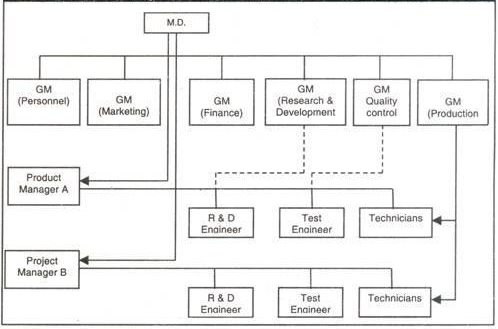 illustrates a single line organizational structure. Have only direct vertical relationships between different levels in the firm. (i) A line structure tends to simplify and clarify responsibility, authority and accountability relationships. The levels of responsibility and authority are likely to be precise and understandable. (ii) A line structure promotes fast decision making and flexibility. (iii) Because line organisations are usually small, managements and employees have greater closeness. (i) As the firm grows larger, line organisation becomes more ineffective. (ii) Improved speed and flexibility may not offset the lack of specialized knowledge. (iii) Managers may have to become experts in too many fields. (iv) There is a tendency to become overly dependent on the few key people who an perform numerous jobs. 5. 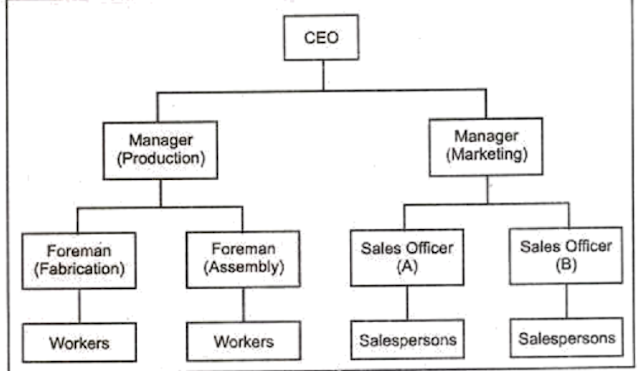 Explain Staff or Functional Authority Organisational Structure? A position intended to provide expertise, advice and support for the line positions. The line officers or managers have the direct authority (known as line authority) to be exercised by them to achieve the organizational goals. The staff officers or managers have staff authority (i.e., authority to advice the line) over the line. This is also known as functional authority. An organisation where staffs departments have authority over line personnel in narrow areas of specialization is known as functional authority organisation. 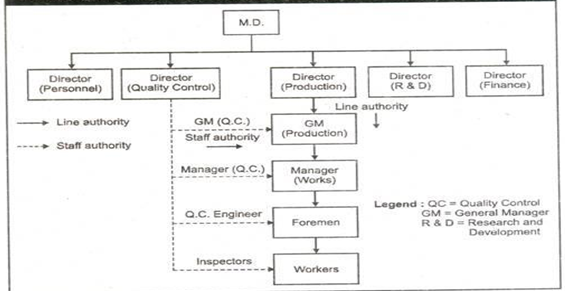 Illustrates a staff or functional authority organizational structure. They are: (i) the potential conflicts resulting from violation of principle of unity of command and (ii) the tendency to keep authority centralized at higher levels in the organisation. • Decentralization reduces the workload of top executives. • It improves job satisfaction and morale of lower level managers by satisfying their needs for independence, participation and status. • Decision making is quicker. • It facilitates growth and diversification. As each product division is given sufficient autonomy for innovation and creativity. • It gives opportunity to subordinates to exercise their own judgment. They develop managerial skills which will be useful to the organisation in the longer run. • Decentralization requires wider span of control and fewer levels of organisation. It speeds up communication. • Decentralization increases the administrative expenses and each division or department has to be sufficient in terms of physical facilities and trained personnel. • As each department or division enjoys substantial autonomy it might lead to co-ordination problems. • There might be lack of uniformity and inconsistent procedures as each department might have the authority to formulate its own policies and procedures. 2) Explain the advantages and disadvantages of centralization. • Effective utilization of talents of the top management. • It reduces co-ordination problems as a unifying force integrates all operations. • It allows the development of a strong co-ordinates top management team. • There is uniformity of policies and plans across the organisation. • Centralization organisations are best suited where resources and information has to move swiftly, especially in emergencies. • Duplication of functions and facilities is minimized which in turn reduces costs. • Due to the fact that all decisions are made at the top it might result in delays in decision-making and communication. • Centralized power and authority might be abused. • Doesn’t give an opportunity to lower level managers/supervisors to develop their managerial skills. • Centralized organisation faces the problem of lower motivation levels among workforce. • The success of organisation depends on the competence of top executives which might be quite risky. 3. Explain Committee and project type of Organization Structure? Committees are advisory bodies. They are usually appointed to advise organizations. Examples of committees include; parent teachers associations and student councils which are committees within a school organization. Committees usually delegate certain duties to sub-committees. For example, an executive committee may appoint a finance committee to advise it on financial matters. Note that an element of the line organization exists in the committee organization as all sub-committees are responsible to the executive committee. 3. Committee members can be motivated to participate in group decision making. 4. Group discussion may lead to creative thinking. 1. Committees may delay decisions, consume more time and hence more expensive. 2. Group action may lead to compromise and indecision. 3. ‘Buck passing’ may result. illustrates a project organisational structure. (i) Work is defined by a specific goal and target date for completion. (ii) Work is unique and unfamiliar to the organisation. (iii) Work is complex having independent activities and specialized skills are necessary for accomplishment. (iv) Work is critical in terms of possible gains or losses. (v) Work is not repetitive in nature. 1. Personnel are assigned to a project from the existing permanent organisation and are under the direction and control of the project manager. 2. The project manager specifies what effort is needed and when work will be performed whereas the concerned department manager executes the work using his resources. 3. The project manager gets the needed support from production, quality control, engineering etc. for completion of the project. 4. The authority over the project team members is shared by project manager and the respective functional managers in the permanent organisation. 5. The services of the specialists (project team members) are temporarily loaned to the project manager till the completion of the project. 6. There may be conflict between the project manager and the departmental manager on the issue of exercising authority over team members. 7. Since authority relationships are overlapping with possibilities of conflicts, informal relationships between project manager and departmental managers (functional managers) become more important than formal prescription of authority. 8. Full and free communication is essential among those working on the project. 4. Fast response to change. 5. Flexible use of resources. 6. Efficient use of support systems. 2. Potential confusion over authority and responsibility. 3. High prospects of conflict. 4. Overemphasis on group decision making. 5. Excessive focus on internal relations. The informal organisation is dynamic. (iii) It involves members from various organizational levels. (iv) It is affected by relationship outside the firm. (v) It has a pecking order: certain people are assigned greater importance than others by the informal group. (i) Assists in accomplishing the work faster. (ii) Helps to remove weakness in the formal structure. (iii) Lengthens the effective span of control. (iv) Compensation for violations of formal organizational principles. (v) Provides an additional channel of communication. (vi) Provides emotional support for employees. (i) May work against the purpose of formal organisation. (ii) Reduces the degree of predictability and control. (iii) Reduces the number of practical alternatives. (iv) Increases the time required to complete activities.